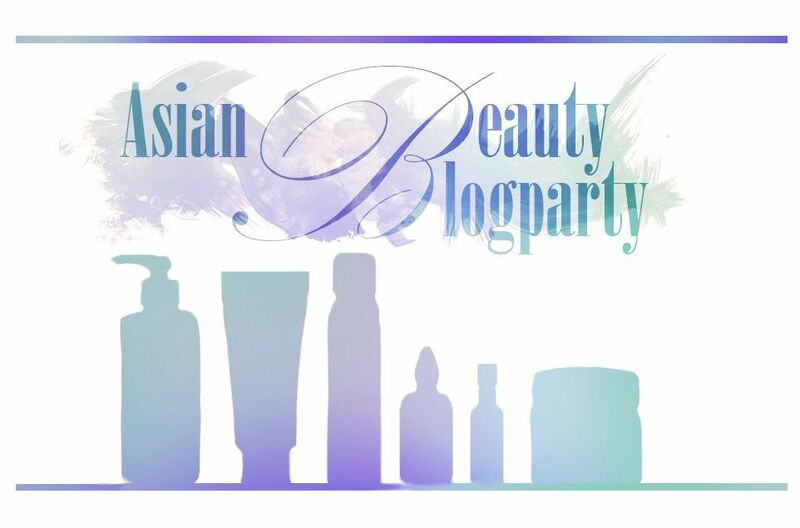 So.. if you have been reading my blog, you know that I have oily skin, blemish prone AND to add insult to injury, I also have aging skin, with sun damage hyper-pigmentation and fine lines and wrinkles. My challenges have revolved around how to moisture, hydrate and prevent further damage to my skin without causing massive breakouts. The western skin care market has for decades assumed that if you over 25 years old, your skin is as dry as the Sahara and you never have a zit. Ever. I can tell you that isn’t true, and even if you have dry skin, like my mother has, you can still have blemishes at any age. The following is just my own personal advice and it based on my own experiences. I am not a skincare professional expert, just a person who loves skincare! If I have reviewed a product that is pictured, I will hyperlink the product name to that review. The review will also highlight ingredients that I love too. 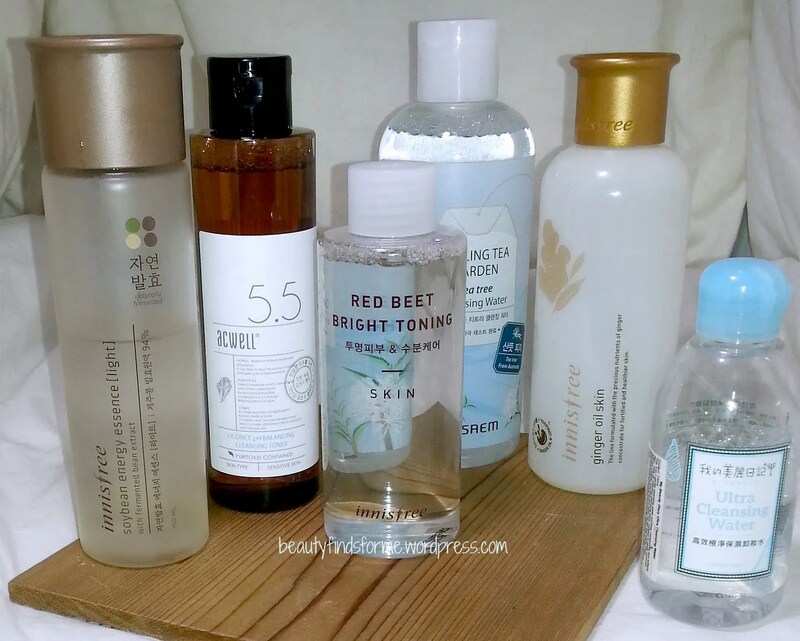 Watery stuff ~ cleansing, boosters, first treatments, toners ~ these are an essential part in my skincare routine. 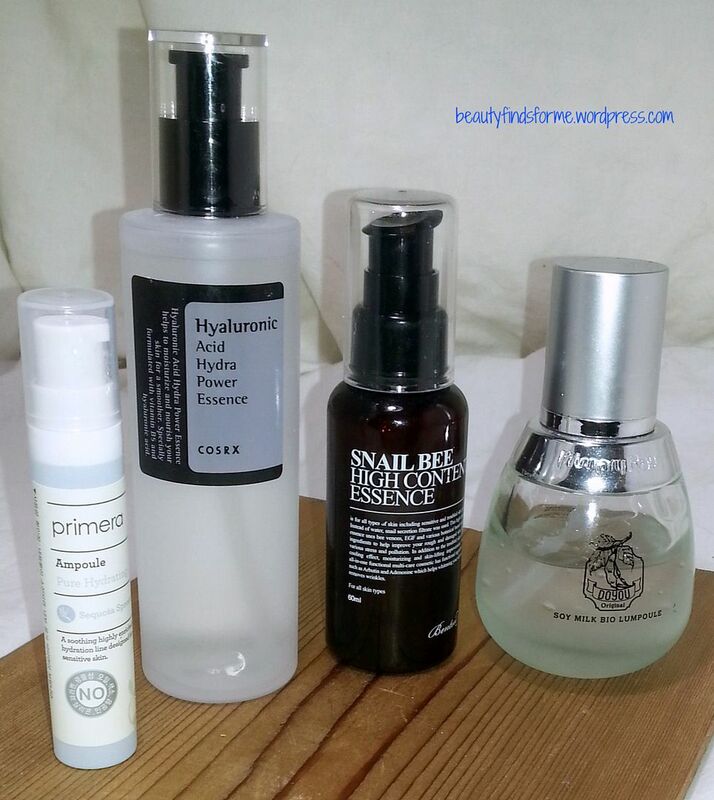 I do sometimes get toners that are more astringent, but I have found that gentle products can help soothe, clean and prep my skin for the next steps. Cleansing waters are one of my favorite things ~ I use them all the time to help remove the dirt and grime at the end of the day, first thing when I wake up to remove any skincare products or just when I want to refresh up my skin. I also use cleansing wipes as they are quick and very portable ~ I keep those in my car and office. 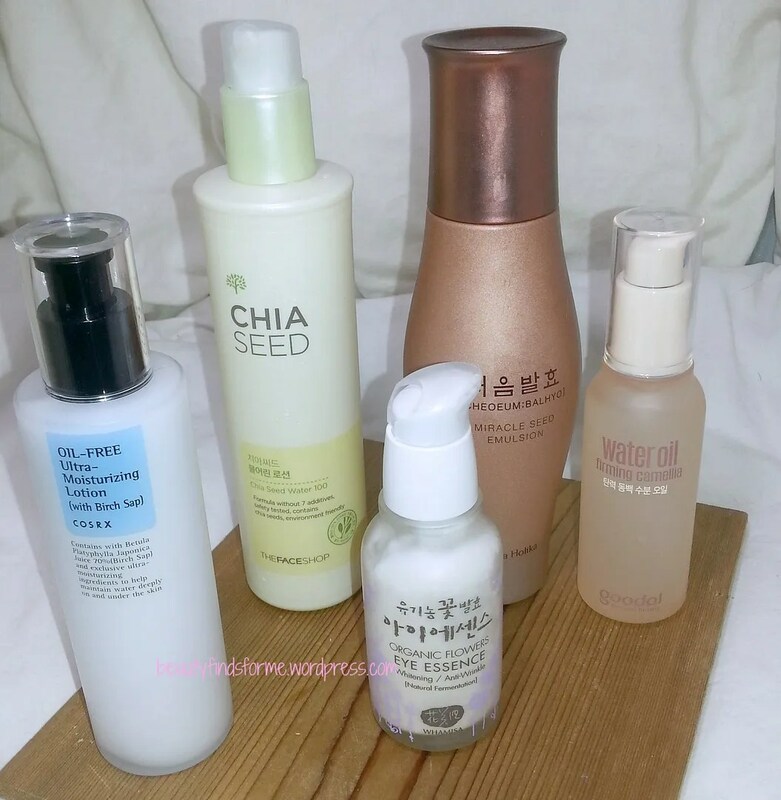 Toners/Skins are lovely and I use them after cleansing waters ~ they help provide intense hydration and moisture into my skin and absorb rapidly. I am a huge fan of organic veggies and herbs in my skincare products, like soybean, licorice and ginger. Hydrate Me! I have oily skin, so I rarely use a rich moisturizing cream unless it is in the dead of cold winter and then as part of my night skincare routine. Most of the year, I hydrate, hydrate, hydrate and layer, layer, layer. This helps my oily skin get the hydration it needs (oily skin gets dehydrated too!) without looking greasy and without breaking out. I layer one or two products like the ones above, depending on my needs, to really give my skin that intense boost of moisture. Ahh, my blemish busters. So, to keep my blemishes at bay and to heal them when they do crop up, I use Zymogen HC Ferment Cream & Melano CC at night, Zymogen HC Ferment Serum, Melano CC and Innisfree Bija spot essence during the day and when it is really bad, I slap on a cosRX Acne Pimple patch which is amazing stuff ~ my blemishes are reduced in size and redness overnight! Melano CC is my HG Vitamin C product because it is the only product I have used that has faded my blemish hyper-pigmentation, those ugly red/purple spots which are different from the sun damaged brown spots. I will never be without my Melano. I also love Zymogen’s fermented line ~ it is soothing but effective. 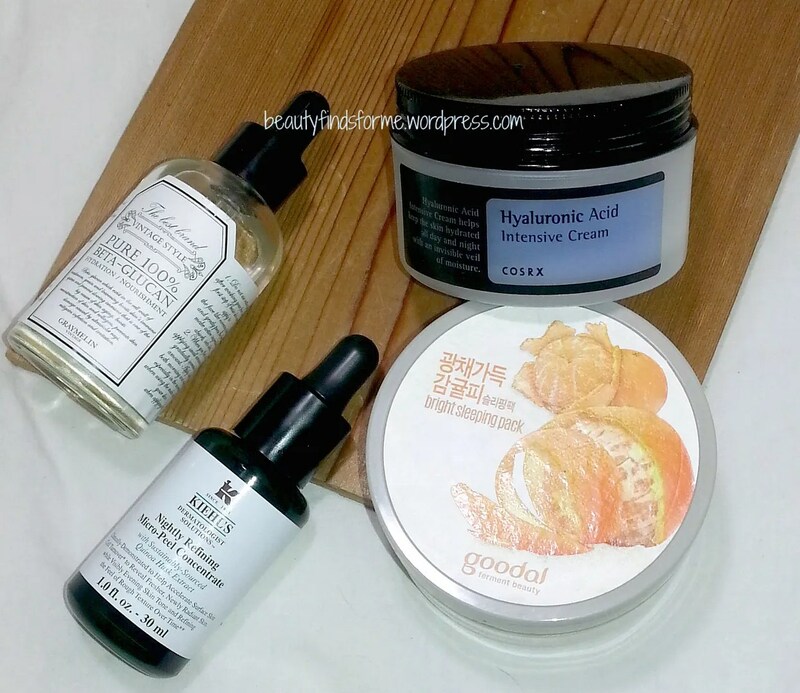 Day Time Moisturizers! As I layer, I look for more lightweight moisturizes, which can also be labeled as emulsions and lotions.. This allows me to lock in all of the hydrating products with a good moisturizer but without added greasiness. I also love Goodal Fermented Watery Oil series as it may be facial oil, but it is so light and absorbs so quickly into my skin. Eye creams and essences are essential to help brighten and also plump up wrinkles and fine lines around your eyes. Why do I love fermented ingredients so much? Fermented ingredients is a classic process that has been around for a few millennia and what it does is allow the growth of good bacteria. This bacteria will create lactic acid, by consuming sugar and starch, and it also creates probiotics, amino acids, antioxidants, omega-3 fatty acids, all sorts of Vitamin B’s and enzymes, which means that it has more nutrients. The fermented yeast helps break down active ingredients which can be absorbed more quickly into your skin. It helps boost other skin care products and is reported to be more potent and very effective for all skin types. I know my oily skin LOVES FERMENTS. I even wrote a blog post last year, stating I would love to see fermented ingredients be a trend in 2015 in the USA. Oils ~ I have resisted putting oils on my skin for a long time ~ I have oily skin, so why add more oil, right? The problem I had was not finding the right oil! Oily skinned types can use oils on their face, but just be careful with the ingredient list and how much you put on. 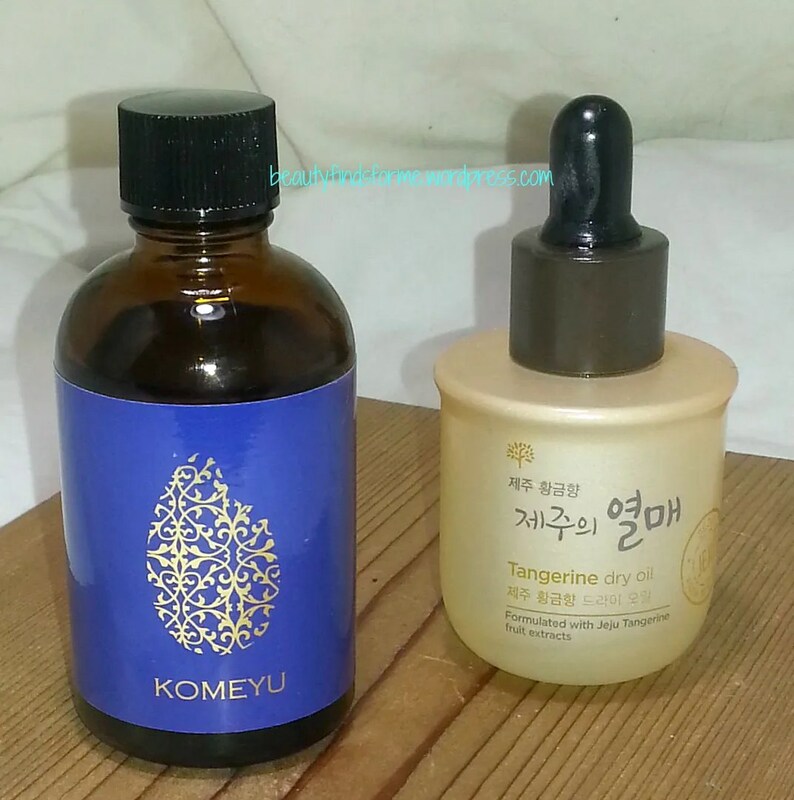 I personally love dry oils, such as my beloved (and probably discontinued) The Face Shop Jeju Tangerine Dry Oil, but I have found that I really love Komeyu Rice Bran Oil as well ~ just in moderation. I love using oils mixed in with other products, like Hyaluronic Acid, Beta Glucan or just a moisturizer and then dabbing it around my eye area at night. My skin is soft and plumped up the next morning. Speaking of Night Skin Care routines.. I never wore anything on my face overnight before discovering K-Beauty. Now, I cannot imagine not using products at night. Several of my products I would never use during the day, but at night, it allows my skin to absorb all of the hydrating, moisturizing goodies and also allows me to target some concerns. My night time routine is more intense and rich than my day time routine, cause I don’t care if my face is shiny!! I also added Kiehl’s (mixing western with eastern here) micro peel concentrate to see if this will help with my sun damaged hyper-pigmentation. As I age, I find that adding more of these products to help hydrate and lock in moisture and nutrients has been beneficial to my skin texture and tone. Best Defense against Wrinkles ~ My advice to all to prevent sun damage hyper-pigmentation and fine lines and wrinkles around your eyes (not to mention skin cancer) Wear sunscreen. All the time. When I was growing up, I think our household had two sunscreens: Coppertone (which I think was an 8 or 15 SPF) and Bain de Soleil SPF 4 (my mom used this and believe it or not, they.still.make.this). When I lived in Los Angeles, I hardly used sunscreen except when I was doing outdoor things, like sailing, cycling, hiking and then I would only apply it in the morning. I didn’t like using sunscreen because it was thick, greasy and clogged my pores = blemishes. 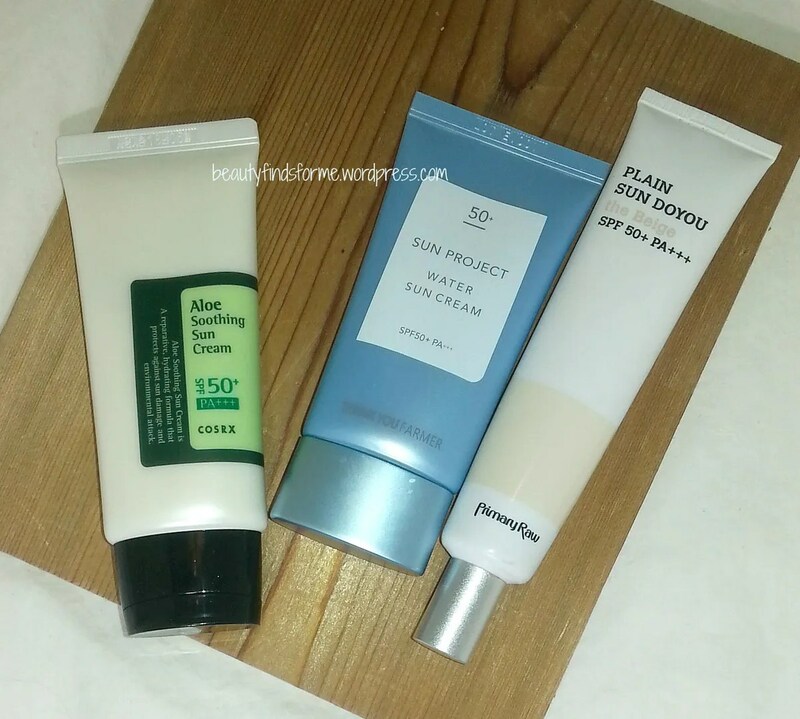 Today, sunscreens are amazing ~ from watery gels to moisturizers with SPF of 30, 45 and 50 ~ and more! 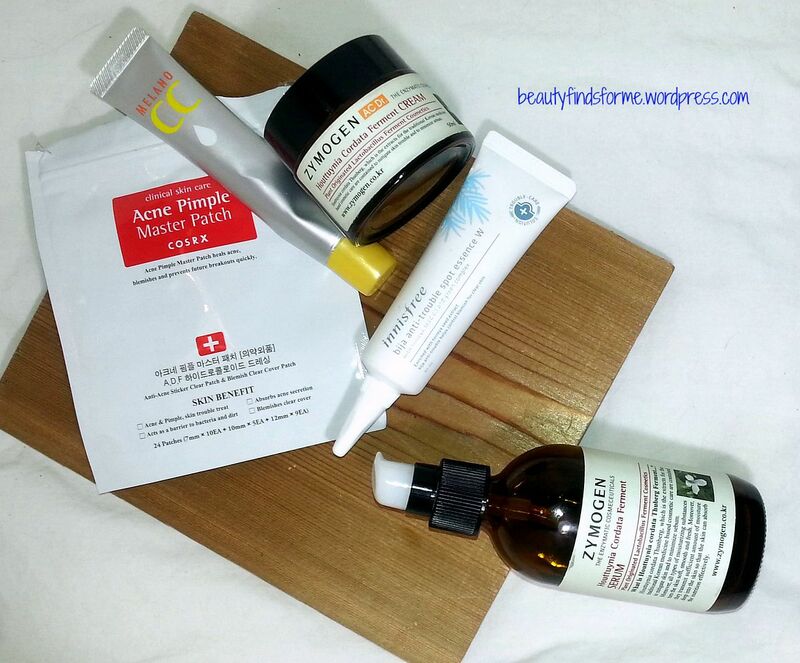 Try them out and find a few that work for your skin type. Sunscreen is your best defense against wrinkles and hyper-pigmentation. You are never too young to start using sunscreen. SheetFace ~ Masking ~ I love it. 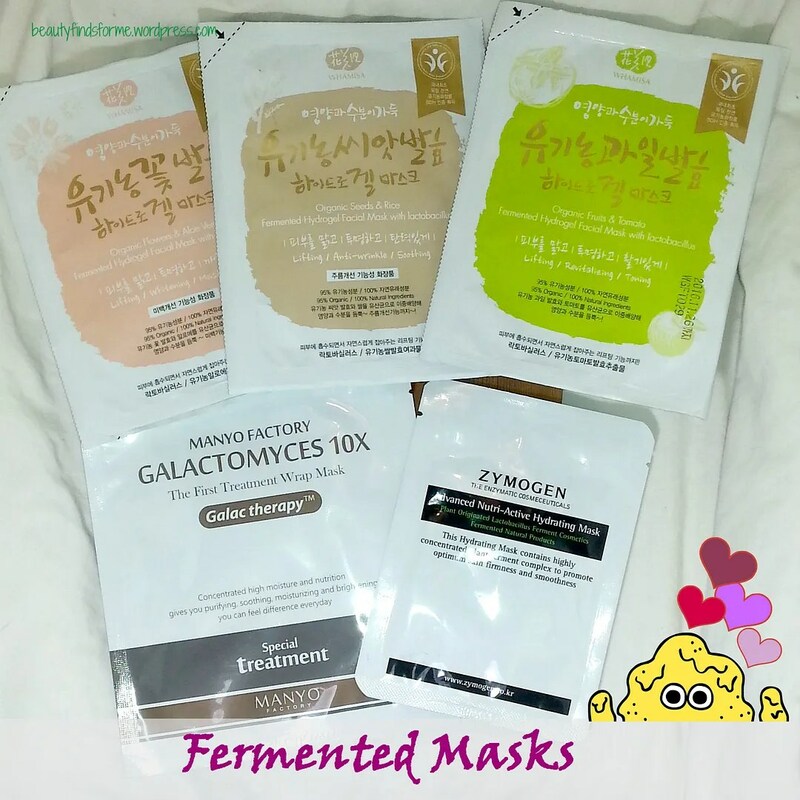 I use a mask at least 5 times a week ~ I have so many of them to begin with, but they also are a great way to relax in the evening or if you need something to help target a particular skin issue ~ check out my mask digests that I write up here. I also think that this is an inexpensive way to find out about a new ingredient or brand and if it works for you. Interested in Snail Bee products ~ purchase Benton’s Snail Bee mask and find out! There are so many types out there, it is hard to keep up. And don’t forget your family, friends, coworkers ~ I have given many masks away to them and even to my male friends & coworkers! They love them. Has any of this worked? Well, I do think since I have stepped up game with skincare, I do think it is making an impact for the most part. There are still problem areas that I have that I would like to help improve, such as my sun damage hyper pigmentation and under eye wrinkles, but I believe I have found solutions for my blemishes and acne hyper-pigmentation, especially with the Melano CC. That isn’t to say I do not still have blemishes, but I have a routine now where I can reduce the swelling and redness quickly without burning my face off. Just as a reference point, before I got obsessed with skincare, my routine was slap on an astringent, toss on a moisturizer and maybe eye cream, and then some zit cream. I am surprised my skin is in better shape despite the neglect. I used to use Proactive and that burned my skin horribly. I also was BAD about removing eye makeup before bed ~ mascara and eyeliner ~ too lazy to remove and that is actually bad for the skin around your eyes. Something about the grime causing premature lines and wrinkles, which I can believe. Unboxing April 2016 Yogi Surprise Lifestyle Box + Promo Code & May Spoilers! Whoo! Fellow oily skin person! We like the same watery, soybean things! Layering moisturisers was such a game changer for me. The realisation that not all moisturisers are thick and gloopy made all of the difference especially with sunscreens! I really like this post style! I have The Saem Tea Cleansing Water coming in the mail, really excited to try it!